Donald and Audrey Hopkins’s overall goal was to write and implement written healthy policies that would improve the lifestyles for the toddlers in their child care program. As the owners of Nurture Home Care, their journey of making healthy lifestyle changes started with simple displays of healthy living artwork of the children in their care. During their time in the National Early Care and Education Learning Collaborative (ECELC), Donald and Audrey learned several innovative strategies on how to get families excited about being healthy. 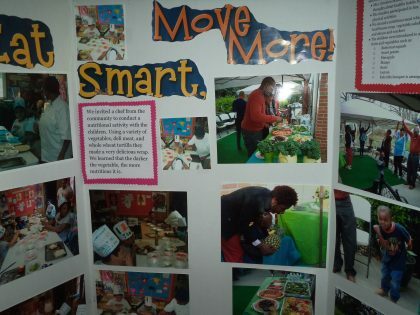 They began hosting family enrichment activities to share the steps they were taking to achieve healthy success. For example, Donald and Audrey decided to invite a chef from the community to conduct a nutritional activity with the children. Donald and Audrey began writing policies for nutrition, physical activity and screen time. Later, they shared a letter with parents about the upcoming policies that will take effect next school year. The parents were receptive of the changes to the program and couldn’t be more happy. The Gallier Home Child Care Center completely transformed into a healthier program after participating in ECELC. Currently, the children only drink water and milk. Family-style dining was incorporated during meals and snack time. They serve primarily healthy desserts like frozen bananas and date brownies to the children. This valuable resource from the American Academy of Pediatrics takes the mystery out of policy writing, covering all facets of early care and education. These model policies, covering a wide range of topics, ease the burden of writing site-specific health and safety policies from scratch.